For the better part of the past 25 years, there has been a monthly gathering of former University of Tennessee at Chattanooga letterman who value the common thread they all share. The group refers to themselves as “Scrappy’s Boys”, honoring the late Moc football coach A.C. “Scrappy” Moore for whom many of them played during his 37-year coaching tenure in Chattanooga. The get-togethers serve as a time to reminisce about old times, mourn the death of another comrade and offer solutions to the world’s problems. “Scrappy’s Boys” are a close-knit group, having invested the years of their youth at Chamberlain Field and now spend their energy serving as a driving force in support of anything related to UTC. They are loyal to their brothers who wore the blue and gold, which made Thursday’s meeting even more special. 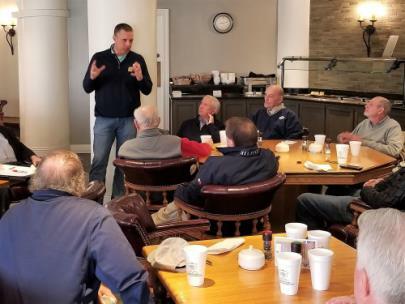 The group took a detour from their regular gathering spot at Wally’s Restaurant to meet at the Chattanooga Golf and Country Club to welcome one of their own. 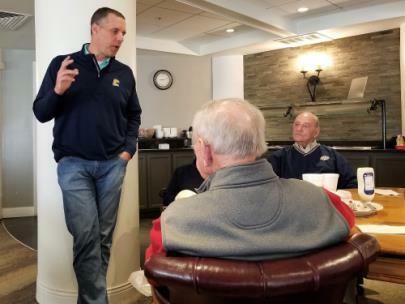 Rusty Wright, a four-year letterman at UTC who was named head football coach in December, was invited to share his insights on his return to Chattanooga. Having graduated from UTC in 1996, Wright had two stints as an assistant coach with the Mocs during his 22-year coaching career. He was on the staffs of Buddy Green and Donnie Kirkpatrick from 1996-2002, then as an assistant to Russ Huesman between 2013-16. But Wright always knew his path would someday lead him back to Chattanooga. 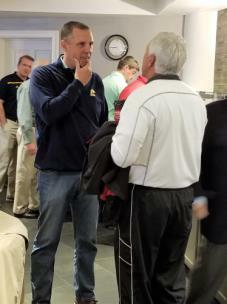 “My wife and I were looking through some old pictures last weekend and I came across the letter I was given when (athletic director) Steve Sloan decided to let Donnie go as head coach in 2002,” Wright said. “We had a couple of average years and lost our first nine games that third season. We’d heard the rumors that a change was coming so by the time we got to the end of the season, all I had in my office was a TV, a VCR and a phone because I’d already moved all my crap out. Wright kept that letter announcing his termination because he knew that wasn’t the final chapter of his time at UTC. Hearing Wright’s passion and knowing his pedigree was music to the ears of Bert Caldwell. Caldwell played defensive back under Moore after transferring from Ole Miss in 1962. Wright’s return to Chattanooga after two seasons at Georgia State represents more than just the opportunity to become a head coach. Wright was part of UTC’s football success under Huesman, and he’s even added the former coach’s son, Jacob, as a member of his staff. He’s actively involved in promoting the program across the region every chance he gets. 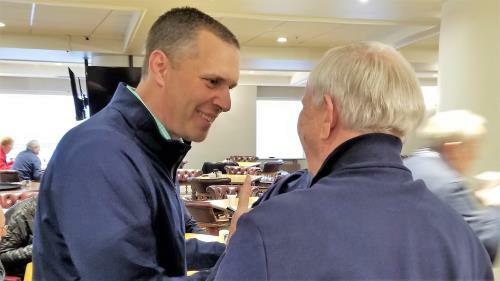 “I’ve been all over hell’s half-acre the last few months speaking to anybody who will listen about what we’re doing here, and I’ll continue to do so,” Wright said. “You guys were there at one time and understand what makes UTC a special place." Even former U.S. Senator Bob Corker stopped by to offer his encouragement to Wright and the gathering of “Scrappy’s Boys”. “I’m honored to meet him. It seems like he’s the right guy,” Senator Corker said to hearty applause. Wright understands the history of UTC’s program and the impact Moore had during his reign.